Hello friends! Part of my spring cleanup has been taming my native sword ferns. 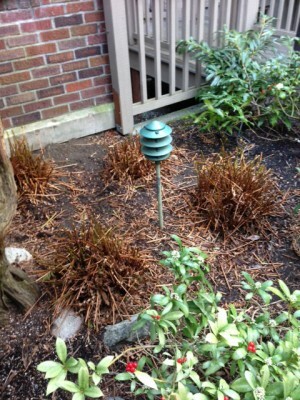 I love our yard because it has a great Pacific Northwest vibe with native plants and large Cedar trees. I cannot even count how many sword ferns we have in the yard. I hadn’t given them much thought until about a week ago. 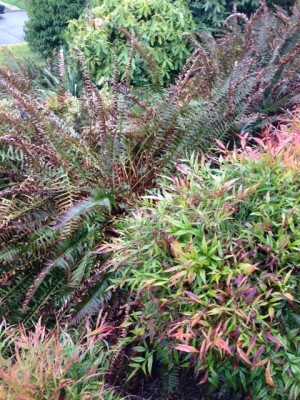 Sword ferns are awesome in the landscape because they require very little. They fill space, providing both texture and bright green color. I have read mixed reviews on how to clean ferns up. Some people say don’t touch them other than cutting out dead fronds, while others advise cutting them back to the crown each spring. The conclusion I arrived at is that we should let the ferns tell us. The ferns in our yard are massive and I decided that mine could use complete renovation. My guess is that they have never been cut back. 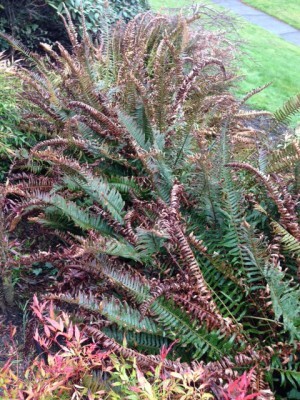 Many of the fronds have brown tips and they are trampled looking. I am cutting most of them back so I can get all the dead fronds and debris out and let the new growth standout. It’s actually liberating to create so much space! The downside is that I waited until now to do this when there is so much other yard cleanup to do. I have two large yard-waste containers and they fill up quickly. In the future, I will tackle this project in February so I can utilize my yard-waste containers more efficiently! I’m not sure I will get to all the ferns this spring but I’m slowly working my way around the yard. I think I’ve cut back about 13 so far! As you can see, the ferns were massive! I couldn’t see between them at all. It’s actually working out well to cut these back now as I am also battling the ivy. Cutting these back has made the ivy vines easier to eradicate! Here are some after photos. Some people cut ferns all the way down to the crown but I left about 4 or 5 inches because I didn’t want to cut the fronds that are coming up. Also, this is somewhat tedious and I have far too many ferns to fuss with this too much. The photo above is right next to the back door, behind our patio. The ferns were so large that we didn’t even know that there was a light out there! Of course, we can’t figure out how to get it working again, but that’s a story for another day! 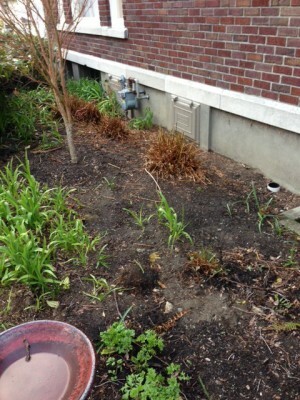 The photo below is of our side yard. The ferns serve as a great backdrop and hide our basement windows. These were so overgrown that they were incredibly trampled looking. I am really excited to see these with fresh fronds. 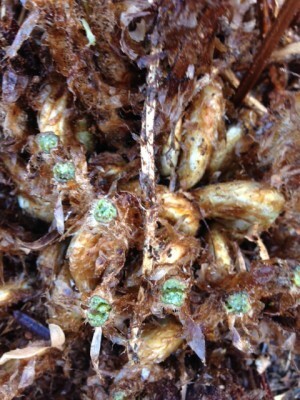 Here is a picture of the new fronds, or fiddleheads, getting ready to sprout up. Spring is such an exciting time of year in the garden! Cool!! You found a yard light. 🙂 Very inspiring. Kind of ironic… while sitting at daughter’s Volleyball tonight, overheard some Mom’s complain about their yards and how they have so much to do and wish they didn’t even have a yard. I’m not there yet.. but see these next 8 years or so being busy. Planters here I come. Oh and maybe mowing the lawn and that is about it. I think it just depends on how you want to spend your individual time. Some people, like Adam, laugh at me when I say that working in the yard is relaxing. Make your time outdoors what you want! If just simple upkeep is what you have time for, so be it!